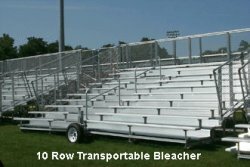 Save money with a transportable bleacher set from BuiltRiteBleachers.com. Share one bleacher set with multiple sports fields. 10 Row - 21'L -Deluxe Transportable Bleacher - Seats 140 - Weight 3863lbs. 10 row x 21' non-elev trans bleacher- Net seating capacity 113-Galvanized steel understructure-(with transport wheel brackets and additional transport bracing)-2 X 10 anodized aluminum seat plank-Double mill finish aluminum foot plank-1 x 6 riser rows 2-9, (2) 1 x 6 top row risers-(1) 48 inch vertical aisle with mid aisle handrail-2 X 6 Treated lumber groundsills-Chainlink guardrail system.